Cereal farmers Danny and Jodi Elford, who have 5,077 hectares at Manangatang, near Swan Hill in Victoria, made a big decision this year. They swapped their 30-year-old manual air seeder for a new Flexi-Coil variable rate seeder fitted with FlexControl electronics and a Task Controller. Along with these changes they also incorporated accurate mapping to pinpoint the best soils on their land. 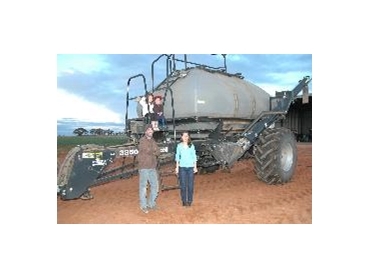 Danny says the Task Controller, a precision agriculture tool which the Elfords have added to their 3850 air cart, has made an immense difference to their farming operation, which used to involve spreading fertiliser across the entire property. While they thought about trialling the precision agricultural system on just part of their property this season, Danny says the potential for fertiliser cost savings led them to jump in and do the whole farm. Danny and Jodi currently have their farm sown with a 50:50 split of wheat and barley. They say they would have upgraded to a new system fairly soon no matter what, but rising fertiliser prices pushed them to do it this year. “It’s not just the input cost savings that led us to buy the Flexi-Coil air cart though, the Task Controller is good for me because I employ labour – I don’t normally operate the machine myself. It’s very difficult to find skilled operators so being able to tell the air cart what to do makes things simpler.